Another culinary discovery on our recent trip to Mexico for the wedding of our friends Chris and Amnesty and cooked by David. 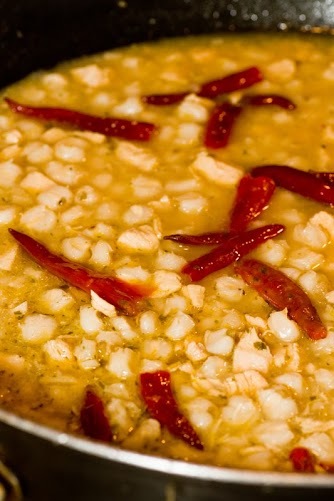 This is a spicy yet refreshing soup with big juicy bits of chicken and hominy. 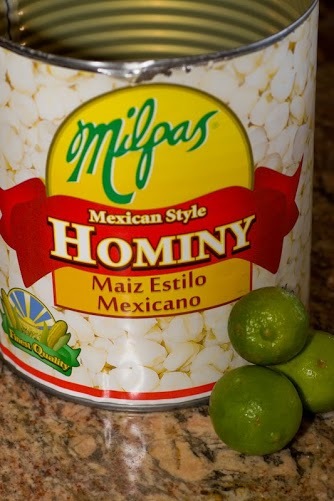 Hominy is white maize which is bigger and starchier than yellow sweetcorn. In this recipe David used tinned Hominy or Pozole which you can get online and from Mexican specialist stores. Using a deep sauté pan or frying pan brown the chicken pieces and garlic. Once browned add the chicken stock and dried chillies (whole), 2 teaspoons dried oregano and bring to a simmer. Once the soup is simmering, drain the hominy and add to the pan together with the juice of 4 limes. Leave on a low heat for 30 minutes. When ready to serve, add a pinch of oregano to the bottom of the bowl. 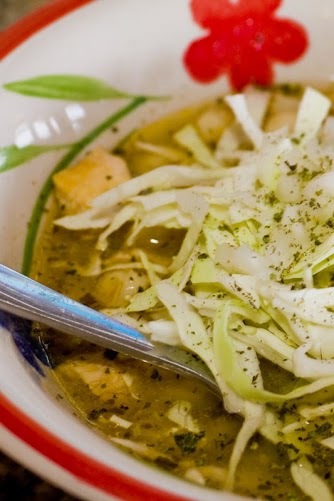 Serve the soup and add a little shredded cabbage and top with a squeeze of lime juice. This is a lovely warming soup perfect in any weather and filling yet light and healthy. It is high in protein and dietary fiber. The soup is dairy and gluten free and low in fat and carbohydrate comparatively to most sandwich based lunches or winter warmer type pie dinners yet fully satisfies resident carnivores.